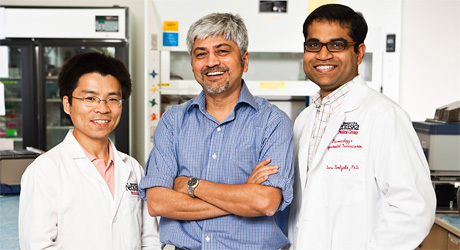 UNMC research scientists Guru Pendyala, Ph.D., Iqbal Ahmad, Ph.D., and XinMing Liu, Ph.D.
People are what make an institution great. The people who work at UNMC come from all walks of life, communities and nations. They are committed and driven to do their best in an organization that embraces diversity and values each person's unique attributes and characteristics. UNMC is committed to being a culturally competent organization where all individuals from different cultural heritages, lifestyles and worldviews are treated equitably and with respect. We promote intercultural awareness and understanding for students, faculty and staff through workshops, lecture series, curricula, special programs and cultural competency courses that are required of all employees. Jobs @ UNMC is the best way to find out about job openings, where and how to apply.